After the flood of 1953, the Dutch (Holland or Netherland) began to lay plans for the "Delta Project". 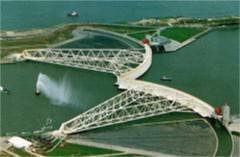 It is a serie of dikes and dams that would complete the North Sea protection works. The Ducht also build the afsluitdijk this is a dike which is from the North Holland till Friesland. This dike is 32km long and takes many years work. The latest flood barrier is the Measlandkering that the 2 curved steel wall with keeps the water out are 325m long and 22m high.